David Cross, left, and Sara McWhorter drew for positions on the ballot for the upcoming general election in November. Both candidates, including Travis Denney, standing behind McWhorter, and Lyle Pierce, not pictured, will be running for Albany Mayor. The deadline has now come and passed for filing for local non-partisan races, setting the stage for the November 6 general election. Although filing for local offices of Albany Mayor, Albany City Council and two Clinton County Board of Education seats started out slow, a last week flurry of filing now includes a total of 26 candidates in races–including three being those who will be automatically seated on the Clinton County Soil Conservation District Board. Other than the three seats that were up for Soil Conservation board members, District One school board member, incumbent Kevin Marcum, will also be unopposed. He represents the Nora, Piney Woods and Snow precincts. The three Soil Conservation members will include Tommy L. Guffey, Kenny Mims and Steve Young. Two people are running for District Five school board member, including incumbent Goldie Stonecipher, and newcomer Bobbie Ann Young Bair, who will appear on the ballot in that order, following the drawing for ballot position. 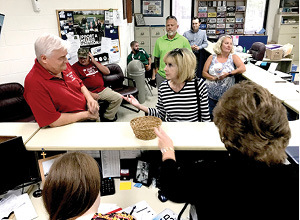 The deadline to file for non-partisan seats was 4 p.m. last Tuesday, August 14 and drawing for ballot position was held in the Clinton County Clerk’s office last Thursday afternoon, August 16. In all, four persons are now seeking the city’s highest office of mayor and will appear on the November ballot in the following order: Lyle Pierce (current assistant police chief); David M. Cross (a local attorney); Sara McWhorter (current water department employee; and local businessman Travis Denney. A total of 16 persons, including five incumbents filed for one of six seats that make up the Albany City Council and will appear on the ballot in the following order: Rene York, Carl Craig, Raymond Shelton, Clyde Stearns, incumbent Frankie Stockton, Reed Sloan, incumbent Leland Hick, Pam Allred, incumbent Tony Delk, incumbent Tonya Thrasher, incumbent Steve Lawson, Jon Cowan and Gene Ferrill. Of the eight total non-incumbents, only one has served previously on the city council in the past, that being Raymond Shelton. Long-time current Albany Mayor Nicky Smith and current city councilman Carl Ferguson did not seek re-election. During the fall election, only a handful of contested races, other than the mayoral, city council and one school board seat will actually be contested. The only two county-wide local races that will see opponents facing each other will be that of Clinton County Judge/Executive and County Court Clerk. All the other county offices will apparently be filled by Republicans who will be unopposed this fall. There will also be only a handful of other races on the ballot, including the race for Congress in the First District and a run-off election for 3rd District Supreme Court Justice. Neither of Kentucky’s two U.S. Senators are up for election this year. A total of six local candidates this fall will be women, including both females seeking a board of education seat, one candidate for mayor and three women seeking seats on the city council. A total of seven women will be on the ballot, as one of the Supreme Court Justice candidates is female. The deadline for anyone filing as a “write-in” candidate for any office isn’t until October 24, just two weeks prior to the election and it should also be noted that a write-in candidate’s name will not appear on the actually ballot, but would have to be hand written in by a voter. More details on the November general election will be published this fall, including a full absentee ballot which will be published in late October.